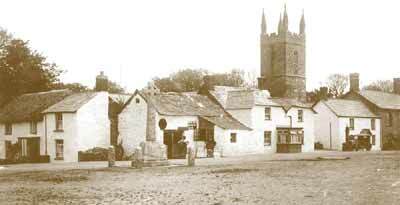 The folk of the village of Bradworthy in Devon are known locally as 'horniwinks', this being the name of a small bird that once inhabited Bradworthy Moor. This book presents a view of the life and times of the horniwinks in the twentieth century. We hope that the book gives you as much pleasure as we had putting it together. The War Memorial in the early 1930's, with the old forge and inn behind. Notice the 2 houses to the left of the forge, which were demolished to make way for the toilet block now there. The development of this book has been a lengthy but fascinating collaborative process, beginning in February 1993. Most of the initial words and photographs came from Tom Cann and Cecil Collacott. However, the sections on the WI and the School are based on the research of Angela Yeo, those on the Football Club and the Memorial Hall are based on the research of Alan Cann, and those on the Village Traders and A Changing Occupation are based on the research of Tom Cann. Parochial material and the section A Changing Way Of Life is mainly the work of Cecil Collacott. Editing, design and DTP of the finished product is the contribution of Phil Mayhall - as is the online version.